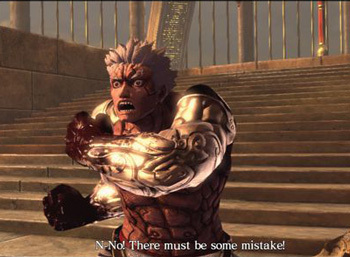 This time it's Asura's Wrath that's fallen victim to Capcom's, apparently broken, spell checker. When Capcom accidentally launched Resident Evil: Revelaitons (note spelling) early this month, we all had a good chuckle at the company's expense. Now it turns out our cruel barbs may have been terribly insensitive, as Capcom appears to be suffering from some kind of debilitating box art-dyslexia. As GamesRadar helpfully pointed out, presumably with a smirk you could see from space, the tagline on the back of Asura's Wrath's game box reads, "Relentless action and near impossible chanllenges." Now the version in question was a promotional copy sent out for review, but with only a week before Asura's Wrath is due to hit the shelves, Capcom may not have time to fix the gaffe. Should the typo make it through to the retail copy, it'll be the third time Capcom has cocked up a game's box art in recent years. The first instance, in case you're wondering, would be that time they accidentally left an IGN watermark on the cover of Okami. And Capcom used to have such nice box art too.